We love, we love to party!!! Here at The Dating Divas, we LOVE to go ALL OUT to make our husbands, families, and friends feel special. So when it is time to celebrate the birthday of one of our special peeps, we just have to go all out to throw them a birthday party they will love! Putting together a fabulous celebration starts with choosing the perfect theme! Today we share with you over 100 of our absolute favorite birthday party themes for you to choose from! Planning the birthday party is part of the fun and we just made planning a little easier for you! 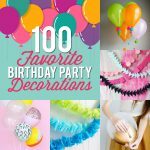 We have gathered our favorite, most drool-worthy party ideas from the best party designers on the web and with over a 100 birthday party themes to choose from, you are sure to find something to make your loved one’s celebration one they will always remember! 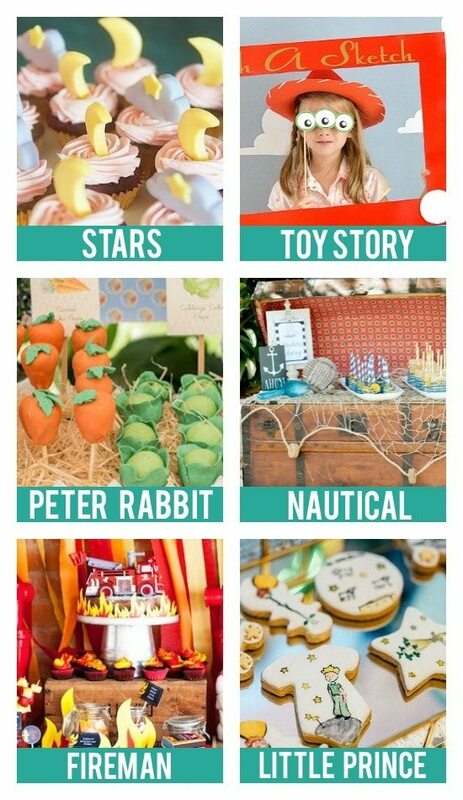 We’ve got fun party themes that are perfect for a baby’s first birthday! We know how important that first birthday can be, and you want to make it perfect! After all, it is a HUGE milestone for our little ones! These first birthday themes will be the perfect way to make your wee-one feel special AND create memories to last a lifetime. 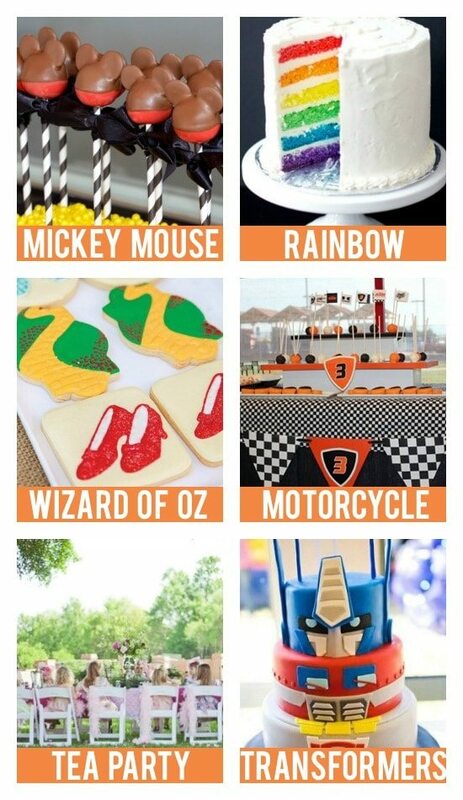 And there are even some extra unique 1st birthday party themes in there, too! Enjoy! 1. Dinosaur (Kara’s Party Ideas) – What kid isn’t fascinated with dinosaurs? This would be a blast for a birthday party! 2. 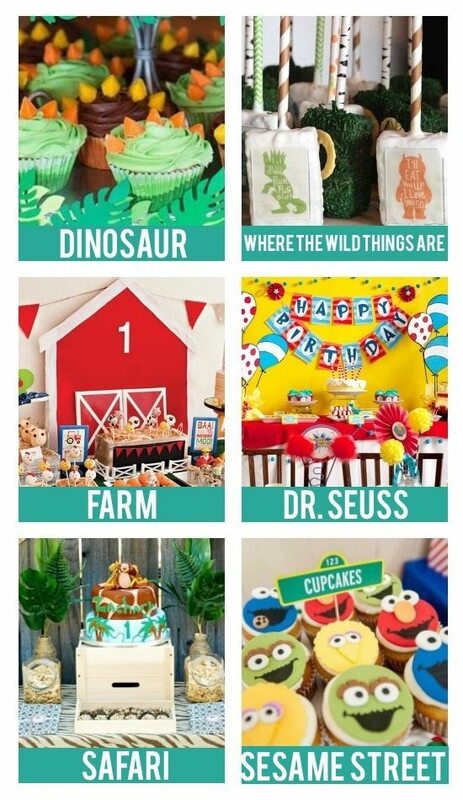 Where the Wild Things Are (Catch My Party) – A fun birthday party theme for your little wild ONE based on the classic storybook. 3. Farm (Hostess With the Mostess ) – For the little one that loves learning about animals – a farm birthday party has it all! 4. Dr. Seuss (Frog Prince Paperie) – A party full of whimsy and fun for everyone that attends. 5. Safari (A Pumpkin and a Princess) – A jungle theme with lots of animals would make for a great party theme! 6. Sesame Street (Catch My Party) – Everyone loves the colorful characters from Sesame Street! It makes for a great party! 7. Train (Train Party) – All aboard for a fun birthday party any kid would love! 8. Owl (Catch My Party) – Look whooo’s having a birthday! Celebrate with this owl-themed birthday. 9. Airplane “Time Flies” (Hostess With the Mostess) – For the child that loves airplanes, this is a fun party theme. 10. 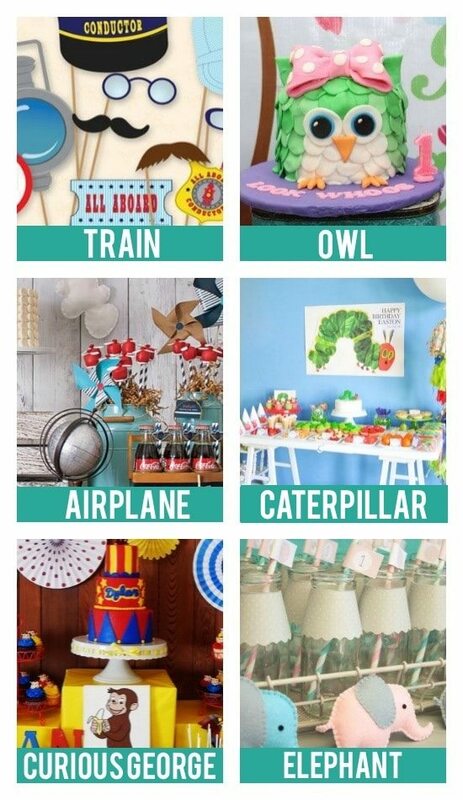 Hungry Caterpillar (Kara’s Party Ideas) – I love all of the colorful ideas for this party based off of a classic children’s story. 11. Curious George (Rae Hearts Design ) – Everyone’s favorite monkey makes for a fun birthday theme! 12. Elephant (The Party Wagon) – What about an elephant theme for your little peanut? So sweet! 13. Twinkle Twinkle Little Star (Baby and Breakfast ) – This theme is simple and sweet, but perfect for a baby’s birthday. 14. Toy Story (The Suburban Mom ) – This mother went all out to bring her daughter an unforgettable party featuring the characters from the movie Toy Story. 15. Peter Rabbit (Kara’s Party Ideas) – In love with the cherished Beatrix Potter character Peter Rabbit? If so then you must see all of the adorable details in this sweet party! 16. Nautical (Pretty My Party ) – The decor ideas are endless with this nautical theme! This particular party has a more elegant feel – check it out! 17. Fireman (Kara’s Party Ideas) – There are a lot of firefighter party theme ideas out there, but this one is jaw-dropping! Every fiery detail is amazing! 18. Little Prince (Catch My Party) – Give your little prince the royal treatment on their birthday with this sweet and semi-elegant theme. 19. Circus (Birthday in a Box) – With colorful decor and fun activities, this is the perfect party theme for little ones! 20. Ladybug (CW Distinctive Design) – Have a child that is obsessed with ladybugs? 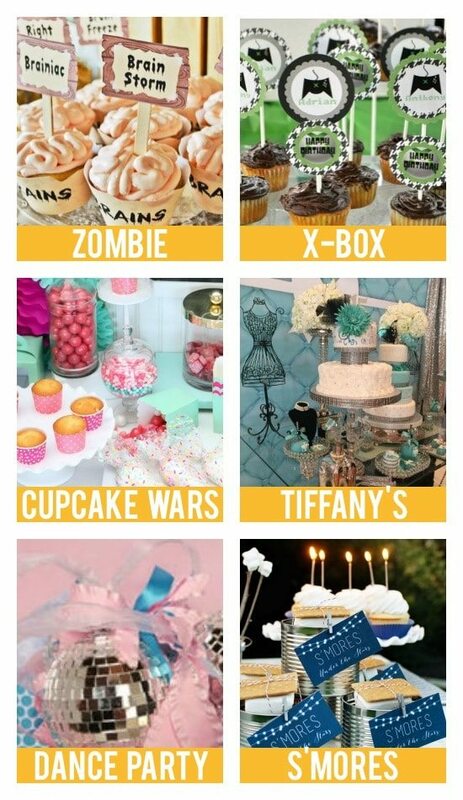 Check out these cute party theme ideas! 21. Winnie the Pooh (Kara’s Party Ideas) – Convert your party into something fit for the Hundred Acre Woods. 22. Fairy (Toni Spilsbury ) – A magical fairy garden party with family and friends! 23. One is Fun (Project Nursery ) – If your baby is turning one – a “One is Fun” party is, well, fun! 24. Mustache (Vens’ Paperie ) – This party is just adorable! Perfect for your little man! When you’re a kid, your birthday is EVERYTHING! Kids dream about their birthday parties for months and months! 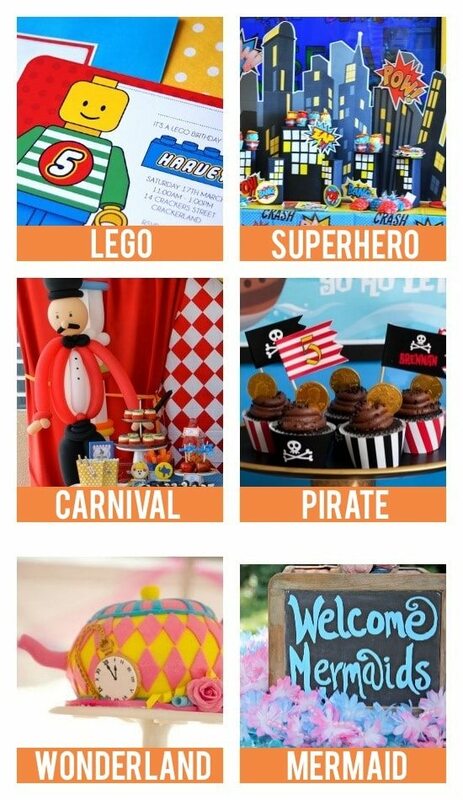 So to help make that day extra special, here are some of our favorite party themes for kids that they’re guaranteed to love! From superheroes to ballerinas – there is something for every kid! 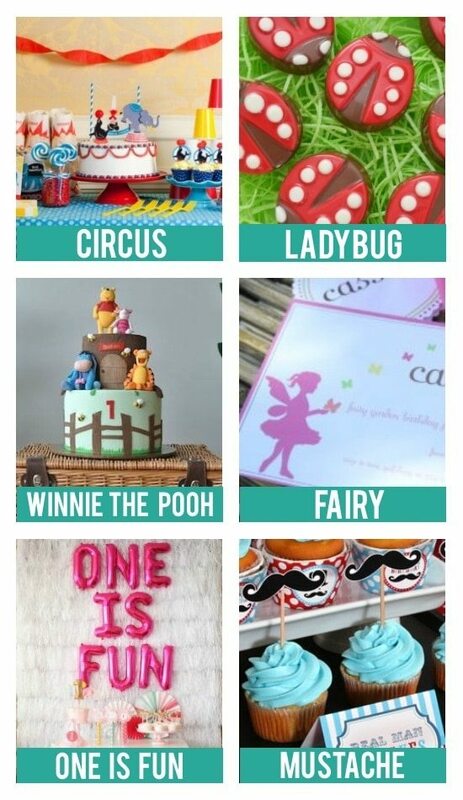 Including birthday party themes for girls AND birthday party themes for boys. We’ve got you COVERED! 26. Superhero (GreyGrey Designs) – Calling all superheroes!!! This party is for you! Fun decor, lots of imagination and a fun theme for a super kid! 27. Carnival (Partylicious) – I just love how colorful this party is! Also, consider all of the fun games that you could incorporate! 28. Pirate (Frog Prince Paperie) – Kids love the adventure of pirates and parents love how easy this party can be to throw together! 29. Alice in Wonderland (Daisy Pink Wish ) – This mom went ALL out for her daughter’s birthday party. I love all of her ideas! 30. Mermaid (The Cottage Mama ) – There are so many fun things that you can do with an under the sea, mermaid theme and this post has all the details! 31. 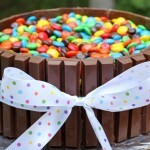 Willy Wonka (TSJ Photography) – A candy-themed birthday party is every kid’s dream come true! I just love all of the colors in this one! 32. Construction (Spaceships and Laser Beams) – A collection of 45 different ideas for a super cool construction party. 33. Pokemon (Pretty My Party) – Pokemon has been popular for a while, but it seems that its popularity has surged even more lately. It would not be surprising to get a request for this party theme! 34. 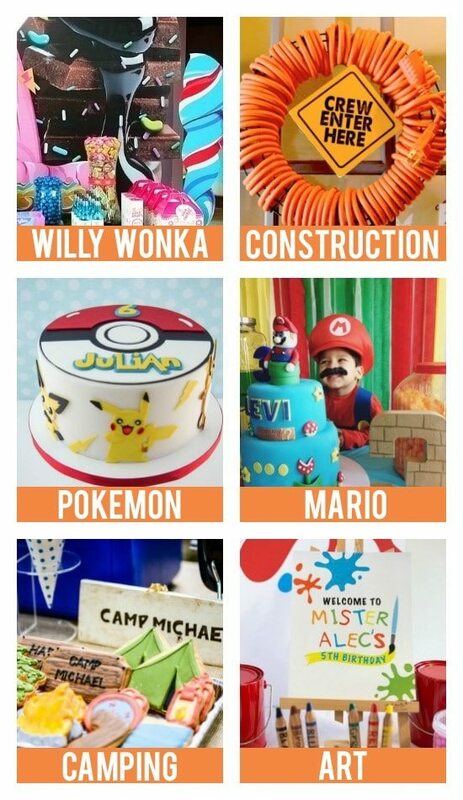 Mario (CinSarah) – This Mario Brothers party is so clever! From the food to the decor – this mom thought of everything! 35. Camping (Spaceships and Laserbeams) – Campfire, roasting hot dogs and s’mores… this party has it all! 36. Art (Anders Ruff ) – A splash of color and lots of interactive activities make this party a masterpiece! 37. Outer Space (All for the Boys) – This party idea is out of this world. All puns aside, this would make for a really fun party! 38. Minions (Tidbits & Twine) – These silly yellow creatures are such favorites of kiddos – why not make it the theme for your next party?! 39. Batman (Pretty My Party) – A favorite superhero makes for a great and memorable birthday party! 40. Superman (Anders Ruff) – For a super party, this post has lots of unique details! 41. 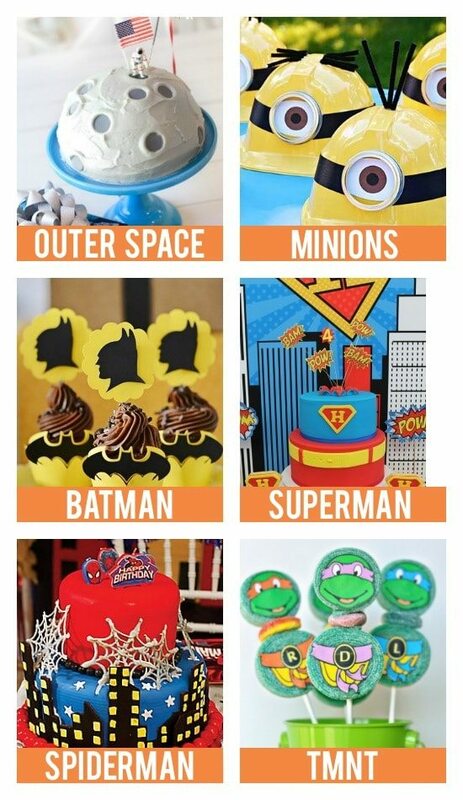 Spiderman (Party City ) – Invitations, decor ideas, party favors, cakes and more! 42. Teenage Mutant Ninja Turtles (Get Creative Juice) – Flashback to my own childhood, these heroes in a half shell are back and more popular than ever! 43. Cookies & Milk Party (Project Nursery) – With the bright colors of sprinkles as inspiration, this birthday party is colorful AND tasty! 44. Nerf (Spaceships and Laserbeams) – Plan an epic party with a kid’s favorite weapon: the nerf gun! Lots of fun at this party and this post has 19 additional links to similar Nerf parties! 45. 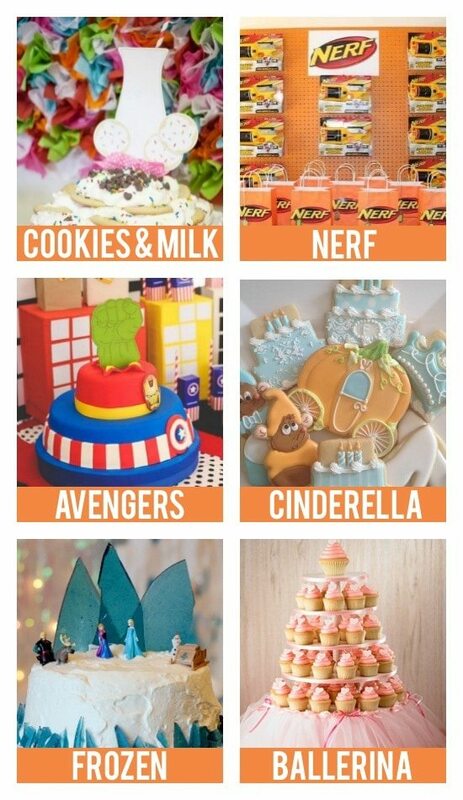 Avengers (Kara’s Party Ideas ) – This is a SUPER idea for a birthday party! There are so many fun ideas! 46. Cinderella (Pretty My Party) – This site has so many links to the best Cinderella party ideas on the web! 47. Frozen (Sprinkle Some Fun) – This party theme is still going strong in popularity! Just check out these adorable ideas! 48. Ballerina (Chickabug) – Pretty, pink and everything a little girl dreams about makes for a perfect little girl’s birthday party. 49. Mickey Mouse (CW Distinctive Design) – I am absolutely in love with the dessert ideas from this post! 50. Rainbow (Little Us) – Links to beautiful decor ideas for a colorful rainbow-themed birthday party! 51. Wizard of Oz (Hostess With The Mostess) – This Wizard of Oz party is so dreamy! Even the tiniest detail was thought of in this party. 52. Motorcycle (I Heart to Party) – If you have a kiddo that was born to ride, this party is for them! 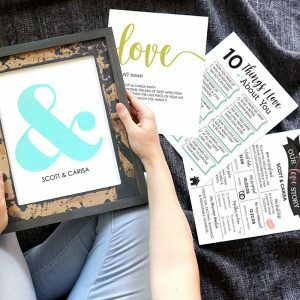 What I love about this particular party are the printables that are included! 53. Tea Party (100 Layer Cake-let) – This tea party would make Lady Mary and the rest of the Crawleys so proud. But if it were up to us, we’d totally attend this party rather than any from Downton Abbey – it is so cute! 54. 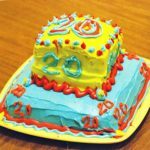 Transformers (Spaceships and Laserbeams) – This site has a collection of 20 ideas for your Transformer birthday party! Teenagers can be tough to please, especially when there are high expectations like a birthday party! 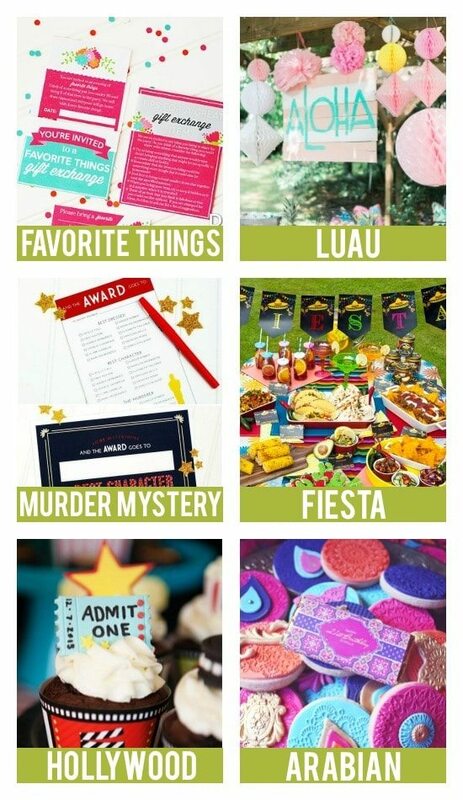 If you need some FUN party theme ideas for a teenager’s birthday, here are a few of our favorite teen-approved party ideas! 55. Glow in the Dark (B Lovely Events) – I think this is my favorite theme of all! Hit up your dollar store for all things glow-in-the-dark and host a black light party! 56. 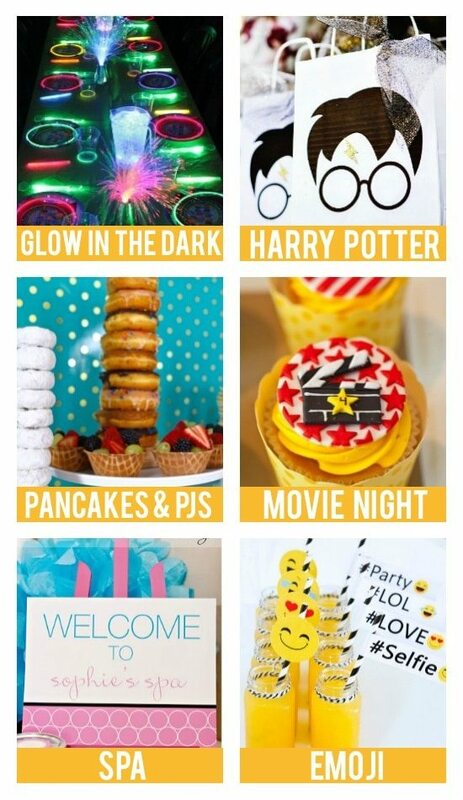 Harry Potter (Spaceships and Laser Beams) – I am sure sometime in their life your kiddo will request a Harry Potter party and this post has amazing ideas! 57. Pancakes and Pajamas (Make Life Lovely ) – The perfect pajama party with a delicious pancake breakfast the next morning. What is not to love? 58. Movie Party (Kara’s Party Ideas ) – Roll out the red carpet to make your teen feel fabulous for their birthday! 59. Spa (Tom Cat Studio) – Turn your home into a spa for an evening of pampering along with celebration. 60. Emoji (The Party Wagon) – This party idea made me LOL. Host a party for your teen that they would want to text all of their friends about! 61. Star Wars (Spaceships and Laser Beams) – More popular than ever, Star Wars would be a hit for a birthday party for any age! 62. Slumber Party (Kara’s Party Ideas ) – Thinking of hosting a sleepover? These party ideas are amazing! 63. Pool Party (Chickabug) – I just love how this theme turned out! So many details and fun ideas! 64. Parisian (Evite ) – Whisk your guests away to the beautiful city of Paris for a fabulous soiree worthy of divas-in-training. 65. Pizza Party (Anders Ruff) – More than just eating pizza, this post has the guests playing chef and creating their own masterpiece pizzas. 66. Laser Tag (Sunny By Design) – Consider moving the party to an activity location such as laser tag! You can still decorate and go all out with the food – just like this mom did! 67. 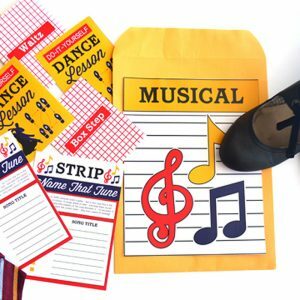 Rock Star (Capturing Joy) – Stage-worthy ideas for a fun music-filled party! 68. 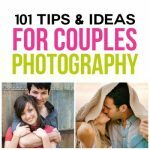 Instagram (Anders Ruff) – This #partyidea is perfect for a typical #teen! 69. 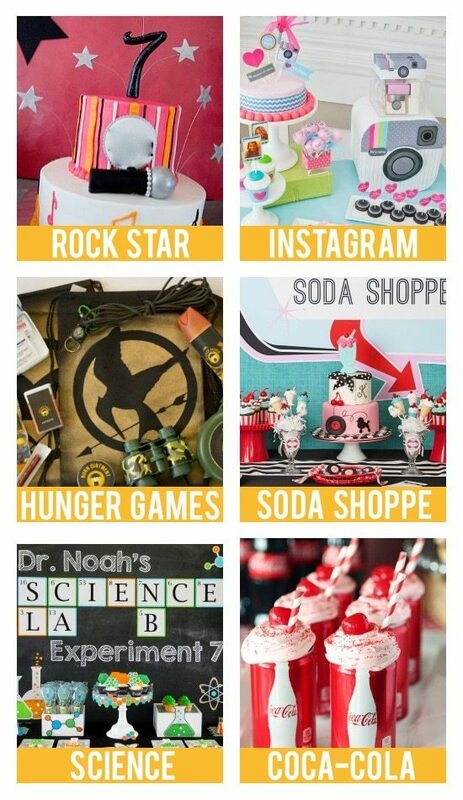 Hunger Games (Chica and Jo) – Every detail of this Hunger Games party is amazing! I love the setup and all of the ideas! 70. Retro Soda Shoppe (Anders Ruff) – This is just too adorable for words! This flashback to the 1950s hits the mark. 71. 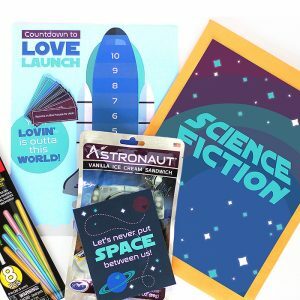 Science (Birthday Express ) – For the teen that has an interest in science, maybe try experimenting with the idea of a science-themed birthday party! 72. Coca-Cola (Living Locurto) – Delicious food paired with this classic drink, make for a great party to just chill and enjoy good food and friends! 73. Lord of the Rings (Southern Blue Celebrations) – If you loved the movie and books, this party is for you! 74. Project Runway (Queen of Theme Party Games) – For a fashion-savvy teen or budding fashion designer, this party idea has it all! 75. Surfer (Birthday Party Ideas 4 U) – This party is perfect for a totally rad dude. I just love all the sweets and treats that are incorporated into the surfer theme! 76. 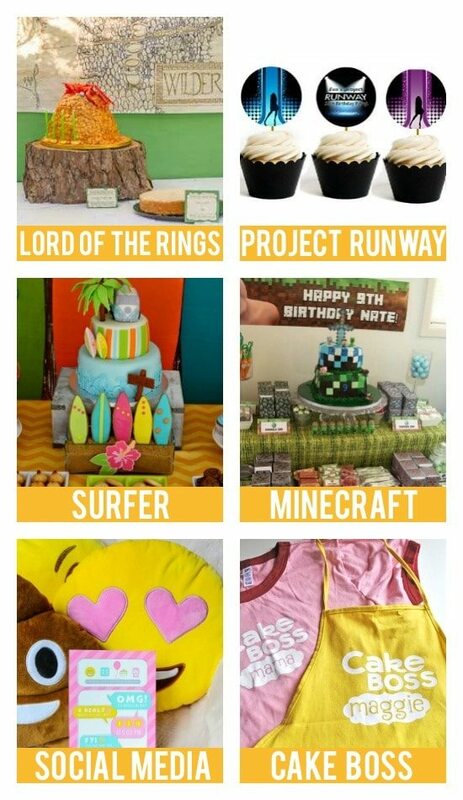 Minecraft (Catch My Party) – This popular game also makes for a popular party! 77. Social Media (Anders Ruff) – OMG! Isn’t this such a fun idea for your teen? 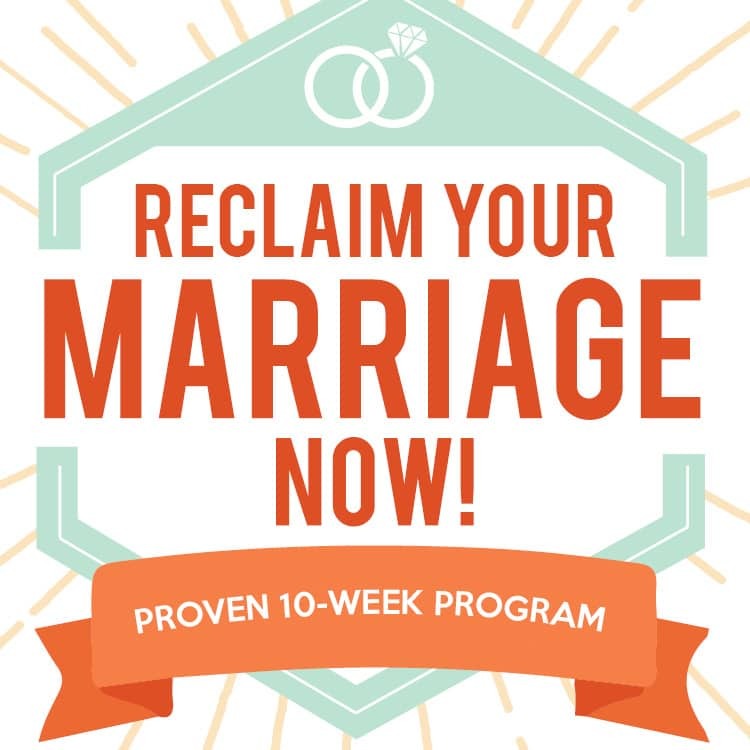 4 real – they will love it! 78. Cake Boss (Club Chica Circle) – I love this idea! For the party activity, guests can decorate a birthday cake “Cake Boss” style! 79. Zombie (Hostess With the Mostess) – There are a lot of ideas out there for a zombie party, but what I like about this one is how kid-friendly it is. 80. XBox (Catch My Party) – My brothers did something like this for their birthday when they were teens and it was such a hit! 81. Cupcake Wars (Oriental Trading) – For a sweet birthday party idea, consider basing the party around the show Cupcake Wars. 82. Breakfast at Tiffany’s (Catch My Party) – On the more elegant side, this party would be perfect for your glamorous teen! 83. Dance Party (The Party Wagon) – This links to a party specifically for teen girls, but any teen would love a good dance party! 84. S’mores Under the Stars (Kara’s Party Ideas) – A fun party idea for a warm summer night! S’mores, maybe a hot cocoa station and relaxing under the stars. I love it all! 85. Pink Flamingo (Anders Ruff) – This party is totally pink and totally fun! 86. 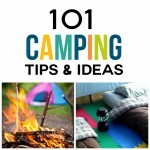 Glamping (Hostess With the Mostess) – A camping birthday party but with some girly flair! 87. 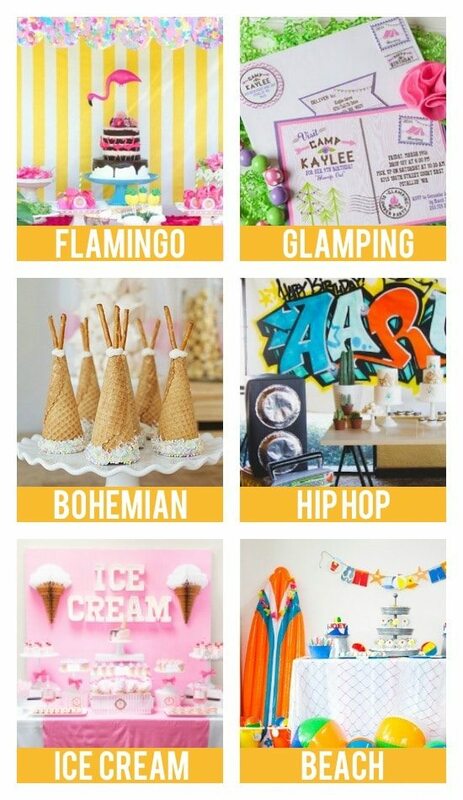 Bohemian (Brit & Co) – Gorgeous ideas for a unique birthday party! 89. Ice Cream Buffet (Chickabug) – Set up an ice cream buffet for your teen’s birthday party and you are set! This is the perfect party idea for a casual social gathering. P.S. This particular link is for a baby’s party, but the idea could totally be applied for a teenager! 90. Beach Party (Evite) – I just love the bright summer colors and all of the unique details of this beach party! One year older, and worth the celebration! Just because you aren’t a kid anymore doesn’t mean you can’t use fun party themes for your birthday! 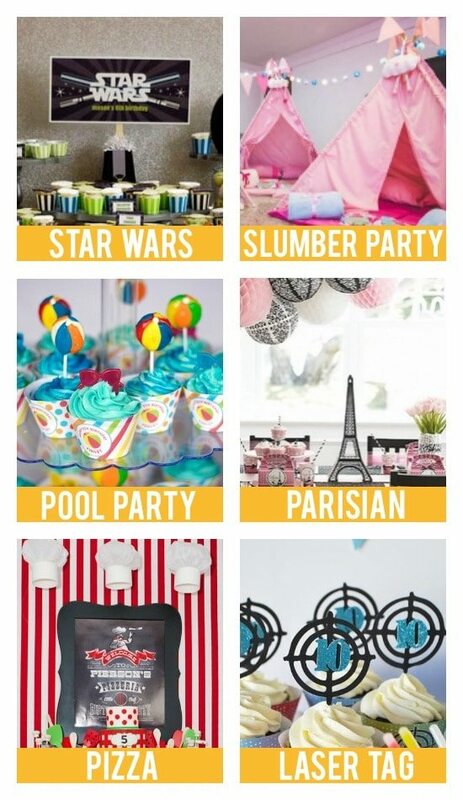 Go all out with any of these fun birthday party themes that are perfect for an adult! 91. Favorite Things (The Dating Divas ) – My friend recently did this for her birthday party and I thought it was brilliant! Each of your party guests brings 3 small gifts and the party consists of a gift exchange. This is a fun way for all of your friends to leave with a gift and new ideas! 92. Luau (Lay Baby Lay) – This specific link is for a kid’s party, but what adult wouldn’t love a good luau?! Delicious food, fun decor and the feel of the Hawaiian isles! 93. 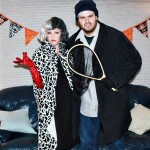 Murder Mystery (The Dating Divas ) – If you haven’t ever done a murder mystery party before, this one is so much fun! Each of your guests acts as a character throughout the evening and try to guess “Who dun it?”! 94. Fiesta (Catch My Party) – You can’t go wrong partying it up like they do south of the border! 95. Hollywood (Hostess With The Mostess) – This party theme is straight off the big screen! This party is classy, fun and definitely award-worthy! 96. Arabian (Anders Ruff) – The bright and bold colors accented by the stunning and artistic desserts make this a jaw-dropping party – for sure! 97. 80’s (Hostess With the Mostess) – Flashback to the decade that just can’t be beaten with a totally hip 80’s bash! 98. Roaring 20’s (Anders Ruff) – It is always fun to dress up for a party and the 20’s is my favorite! It is classy but fun! I love how this particular party turned out! 99. Walking Dead (The Dating Divas) – Fans of the show? This post is loaded with printables and ideas for an evening with friends and all things zombies! 100. Retro Bowling (Anders Ruff) – Bowling only gets cooler with age and adding this retro look to the party makes it EXTRA cool! 101. Vintage Garden (Kara’s Party Ideas) – Looking to do something more on the classy side? Maybe a lovely garden party would suit your party style. 102. Amazing Race (The Dating Divas) –While this post is technically a date, several of our readers have written in that they did this for their birthday celebration! What a fun idea! 103. Bonfire (Such The Spot ) – Campfire food, blankets, s’mores, the glow of the fire – what wouldn’t be amazing about this type of party? 104. Gatsby (I Heart to Party) – If you are doing a themed party, why not go all out? Turn your party back in time to the 1920’s a la Great Gatsby! 105. Bollywood (Hip Hip Hooray) – I just LOVE everything about this theme! The colors, the food – you can’t go wrong with a Bollywood birthday! 106. 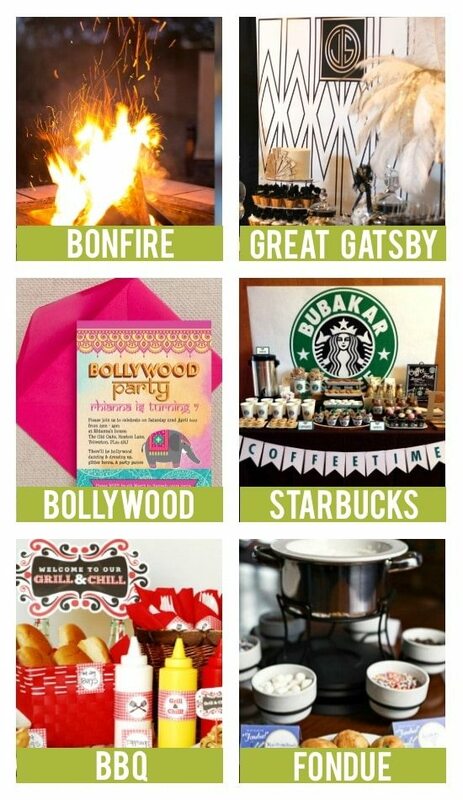 Starbucks (Catch My Party) – Everyone’s favorite coffee shop also makes for a favorite birthday party theme! 107. Grill and Chill BBQ (The Dating Divas) – Invite all of your friends for a fun BBQ! We have free printables and everything! 108. Fondue (The Dating Divas) – Invite some friends over for an intimate and unique dinner over fondue! There you have it! 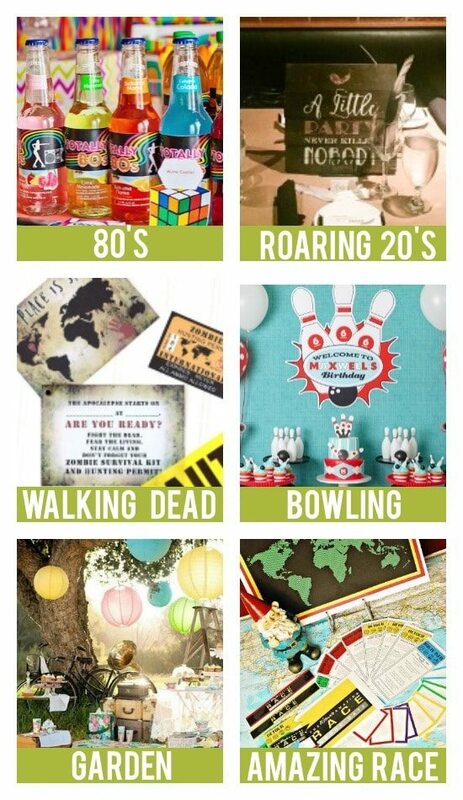 over 100 birthday party themes! Now, how are you going to choose? That tends to be the hardest part! 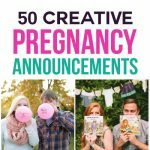 I love these ideas – so creative! I like the rock and roll idea and the sunglasses are so 80’s! This is an AMAZING round-up!